Hamid Mir's Son Just Got Married And The Star-Studded Guest List Will Leave Your Jaws Dropped! Celebrity weddings are the most fun! Because they’re all juicy and spicy and people love seeing other celebrities getting dressed on someone’s wedding. Matlab dulha dulhan toh dekhny he hain but how about checking out all the other guests; what they wore and how expensive were there outfits etc. In the list of showbiz celebrities there many who have spent a fortune on their weddings! Some people get amazed and the other half bash the hell out of them for spending loads of money on just a wedding and what could have been done in a much lesser amount. Apart from these showbiz celebrities, there are other celebrities whose weddings are just “kamaaal”! Hamid Mir’s son got married and the guest list just got us shocked. DG ISPR Asif Ghafoor tweeted this photo on his twitter and congratulated the couple and Hamid Mir on the wedding! This is just not it, Shoaib Akhtar, Jugnu Mohsin, and the famous anchor couple Kashif Abbasi and Mehr Bokhari were there too! Such a star-studded wedding it was! And just when the people thought this was it, there were more on the guests’ list! Asif Zardari and Bilawal Bhutto Zardari were found on the stage with the couple! Woah! Now, this is what we call a “lavish” wedding! Hopefully not the looooongest wedding but surely a very expensive wedding as it may seem. 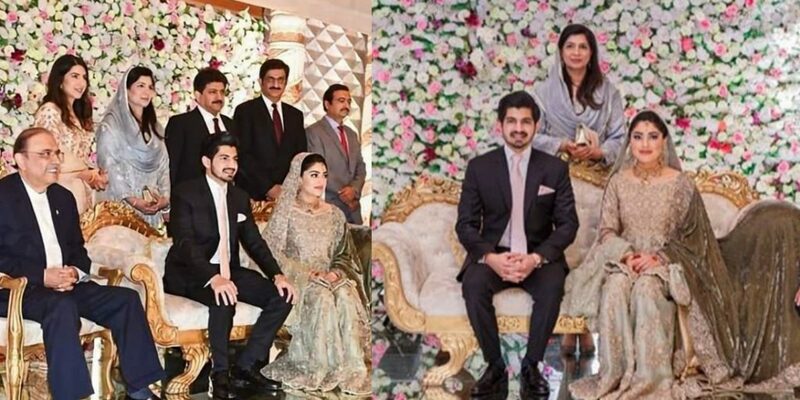 Last year, there was another such wedding which got people stuck to their phones for more photos; it was when Raheel Sharif’s son got married! None of us would have seen Raheel Sharif in such a jolly mood but at the wedding, he was all smiles and what a sight it was! Hamid Mir, on the other hand, is actually not only one of the renowned anchors but he’s also the highest paid anchors Pakistan has. Hamid Mir is also the only Pakistani anchor to have ever interviewed Hilary Clinton, Osama Bin Ladin, and many famous names!